For 20 years, Father and Child Trust have been resilient, surviving many tough times, delivering information and support for all dads, almost all over the country. However, under pressure like many charities, a funding shortfall has required urgent and clear action. Father and Child has ceased trading as of March 1st 2019 and unfortunately will be winding up its services. Support Staff will be working on a Volunteer Basis until further notice. 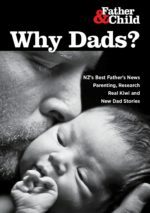 Auckland will continue the Fathers’ Mauri Ora Circle on Wednesdays 7-9pm, with thanks to the support of http://www.kidzneeddadz.org.nz. Our Support Workers will continue to answer our phones, monitor emails and Facebook messages, but they will possibly not be able to attend meetings. Father and Child will stick to their Priority Schedule with focus on dads in crisis, with young children, who are in danger and/or have little other help. We have limited numbers of our Why Dads? info for expecting dads, Ante Natal Dads Guides and New Baby Magazines. Please contact us if you wish to receive any of these. We thank the many good funders and volunteers, including local dads and students who have helped us keep going. We will do everything we can to transfer these services to other charities so that Auckland and Christchurch Dads can have continued support in their role as a parent. If anybody wishes to help administer, volunteer or assist in any way, please let us know.